Black walnut trees are found in the eastern part of the United States. The wood of the black walnut is often used to build furniture. Unfortunately, black walnut shavings are sometimes found in horse bedding, causing a toxic reaction in horses who eat or come into contact with the shavings. The specific toxin that causes problems in horses is unknown. Researchers once suspected the toxin was juglone, a chemical produced by the black walnut tree that prevents plants around it from growing. However, according to the University of Minnesota, administering juglone to horses orally or through the skin does not reproduce the toxic effects of the tree. Horses usually experience negative effects within a few hours of exposure to black walnut. 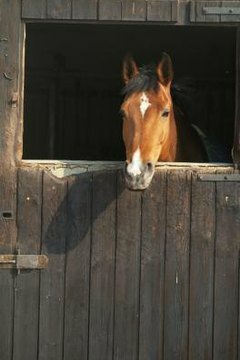 Bedding that contains as little as 20 percent black walnut shavings is toxic to horses. In most cases the poison affects horses who ingest the shavings, although poison may also enter the system through the skin. Initial symptoms of black walnut exposure include depression, a stiff gait and edema in the legs, warm hooves and laminitis or founder. More severe symptoms as the toxicity progresses include colic and edema in the neck and chest. Horses will have flared nostrils and increased respiration and pulse rates. If the laminitis is severe, the coffin bone may rotate and cause permanent damage to the hoof. Most of the symptoms will reverse themselves within days of your removing the contaminated bedding; however, you should contact your veterinarian if your horse shows signs of exposure. Nonsteroidal anti-inflammatory drugs may be prescribed to treat pain and additional treatment may be needed to resolve colic and laminitis. If the laminitis is severe, the horse may need corrective shoeing. Ensure that no black walnut trees are growing in your horse's field or paddock. In addition, make sure that the bedding you purchase is not contaminated with black walnut shavings. Ask the supplier to confirm that no black walnut was used, and check the bedding for possible contamination. If the shavings contain pieces of darker, chocolate-brown wood, it may be black walnut.